You probably noticed that cupcake or fairy cake pictures are becoming a recurring feature to my Sunday blog posts. I am working my way through my Vegan cookbook. Last week I made Crimson Velveteen Cupcakes (Red Velvet Cake). The picture on the left are the cake prior to cooking. For anyone who isn't familiar with the US craze for Red Velvet cake it basically is a rich chocolate sponge with red food colouring. I finished them off with pink vegan buttercream. I received some samples with an order I placed. I have used Dr Bronner liquid soap for a long time but have not tried the solid bars. 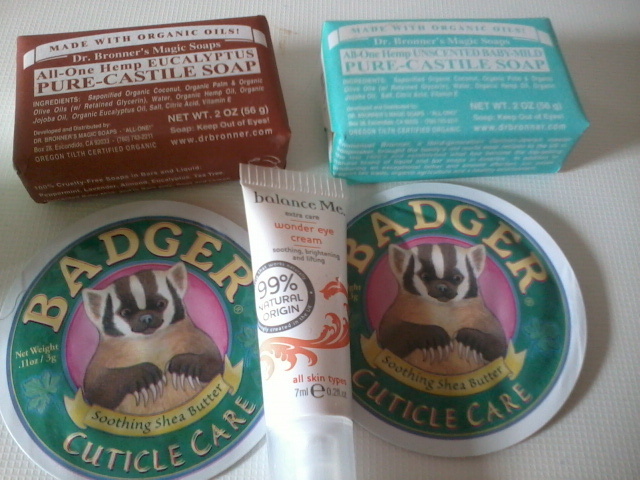 I have not sampled Badger products but sadly the cuticle care contains orange so I dare not try it. The Balance Me Eye Cream sample you will probably all recognise this as it was free with Glamour magazine. 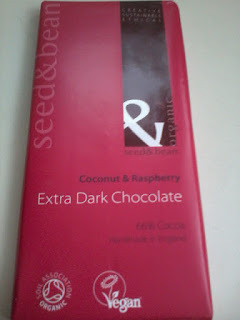 Last weekend I picked up Seed & Bean coconut & raspberry chocolate (dairy free). 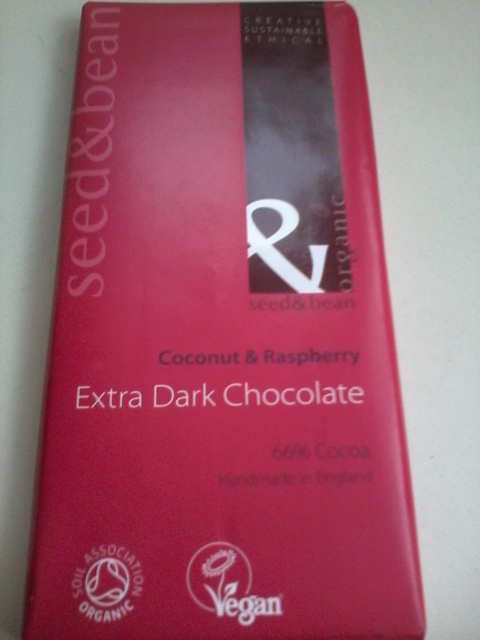 It is 60% cocoa which is my limit when it comes to dark chocolate. I am not sure whether my taste buds are out of order at the moment but I couldn't taste the coconut. In terms of chocolate quality it was very tasty and I do recommend. Yesterday I found the rice pudding mixes pictured above. I picked them up thinking why am I bothering to look they are bound to contain milk. I ended up yelling out to my Boyfriend to come read the ingredients as I didn't believe I had read them correctly. 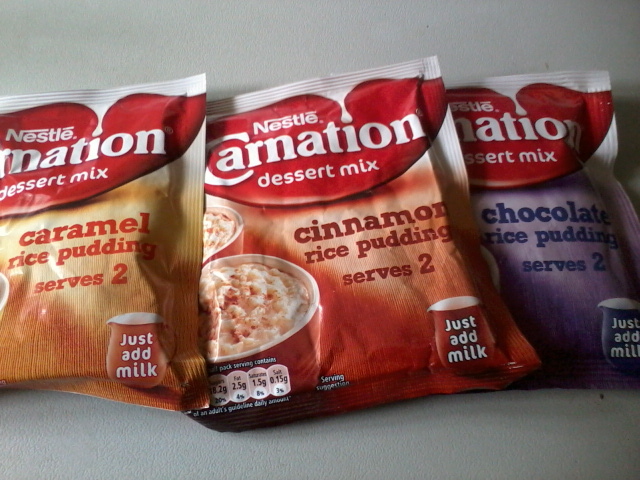 All three flavours have no milk in the ingredients simply a "may contain" warning for nuts, milk, eggs, soya and wheat. I tried out the cinnamon last night and I have no complaints. I used soya milk but you could easily substitute for a milk you enjoy. Very easily whipped together and cooked on hob or in microwave. Packet says it serves 2 but I scoffed the lot myself :) These are currently on special offer 3 for £1 at Tesco or 79p each. These a labelled suitable for Vegetarians. Today I am featured over on Natural Beauty Cabinet click here and check out my interview (link). I would so like to try those cupcakes (if I liked cake lol) I just bought some of that chocolate from H&B wish they had had that flavour though although shame bout the coconut!